MANILA – Senator Antonio Trillanes IV could be in a state of paranoia for claiming suspicious-looking men have been casing his house while he remains holed up in the Senate, Malacañang said Tuesday. “First, it’s drama; now it appears to be paranoia,” Presidential Spokesperson Harry Roque said when asked in a Palace press briefing about the opposition senator’s claim. Trillanes has also reportedly said the suspicious-looking men on board “unregistered” vehicles could be from the government intelligence units. 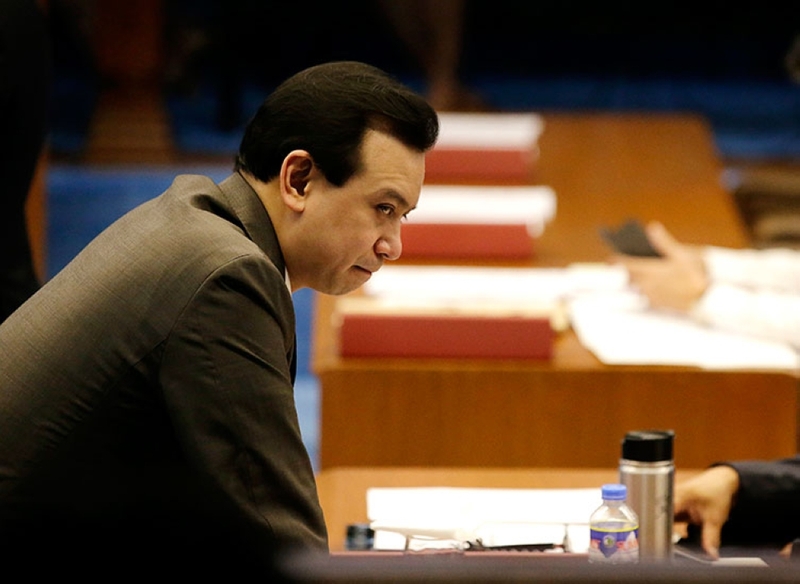 Roque refuted Trillanes’ suspicion, saying President Rodrigo Duterte has left Trillanes’ voided amnesty to the Makati Regional Trial Court (RTC). “I think it’s very clear, the President has left the matter to the RTC of Makati; and so as the Supreme Court,” Roque said. On August 31, Duterte issued Proclamation 572 declaring void ab initio (from the beginning) the amnesty granted by the previous administration to Trillanes. Duterte cited Trillanes’ failure to comply with mandatory requirements such as amnesty application form and admission of guilt to the crimes of rebellion he committed against former President and now House Speaker Gloria Macapagal-Arroyo. In his proclamation, Duterte ordered the military and police “to employ all lawful means” to arrest Trillanes, prompting the former Navy officer to seek refuge in the Senate. Trillanes requested for temporary restraining order against Proclamation 572 but the Supreme Court (SC) turned it down. Despite the SC’s verdict, Duterte still opted to wait for Makati RTC’s decision on the Department of Justice’s request to issue an alias warrant of arrest and a hold departure order against Trillanes. Roque had earlier said Trillanes is just trying to make drama to gain political mileage for staying in the Senate since September 3, despite assurances from the government that he will not be arrested without a court order. He said the SC ruling has actually removed legal impediment to arrest Trillanes, but Duterte decided to wait for the lower court’s decision out of respect. “There is no legal impediment but there is such a thing as respect for the courts,” Roque said in a previous press briefing. Chief Presidential Legal Counsel Salvador Panelo said Trillanes’ amnesty was also null and void from the very beginning since it was former Defense Secretary Voltaire Gazmin and not former President Benigno Aquino III who approved his amnesty.